Dr. Stefan Kusterer, CTO and Co-Managing Director of Körber Digital, talks about digital innovation and the potential that Industry 4.0 offers for mechanical engineering. Dr. Stefan Kusterer studied computer science and mathematics at the University of Passau and received his doctorate there. While occupying various positions at SAP, most recently as Chief Architect IoT, he gathered in-depth expertise related to the Internet of Things. In January 2017 he was appointed CTO of connyun GmbH, and since August 2018 he has been the CTO and the Co-Managing Director of Körber Digital. Mr. Kusterer, as an international technology group, Körber is placing its trust in permanent innovation. How would you describe the role of Körber Digital in this context? Mechanical and plant engineering are the strengths of Körber’s operations. The ongoing digital and technological development of the Group will help us to continue to live up to our claim to market leadership through technological leadership. We are implementing our strategy of digital advancement at every level, in all of our functions, and at all of our locations — because we want to significantly increase the digital component of our products and services. Körber Digital serves as a nucleus for digital innovation and new digital business models. We are shaping and accelerating this transformation, and we are the central point of contact for all topics related to digitization at the Group. Digitization affects all sectors and all areas of life. Which themes is Körber focusing on? For mechanical and plant engineering, the main keyword is certainly “Industry 4.0” — in other words, the integration of industrial production with intelligent digital systems. But Industry 4.0 can be successfully implemented only if we take the right approach. It begins with the right business model, followed by a structured innovation process and an implementation process in which we can build on an extremely broad range of expertise. If you don’t have a good understanding of industrial production, you can’t develop any Industry 4.0 solutions that really create value. Modern solutions and proven methods – love is in the details. What are the crucial levers in this innovation process? In traditional mechanical engineering, the development cycles are often very long. By contrast, digital products and services are competitive only if they are implemented in short cycles. At Körber Digital we achieve short cycles by being in direct contact with our customers from the very start. As a result, we are directly involved in the development process, and we can immediately recognize customer needs and develop the right solutions. If it becomes evident during the joint development process that the product will not provide the benefits we had hoped for, the project is stopped. This means that we are working in structured yet flexible ways and that we can keep our losses small and offer our customers genuine added value. 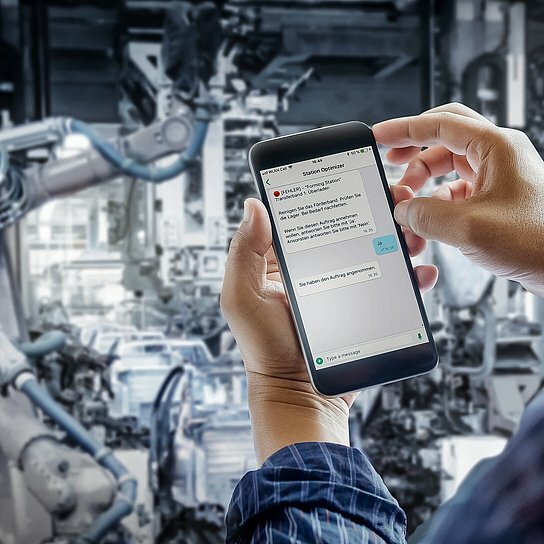 One of the basic concepts of Industry 4.0 is the “intelligent factory,” in which the plant equipment, logistics systems, and workpieces communicate with one another by means of the Internet of Things. In this context, we have worked together with a customer and used agile methods to develop “K.Edge Solutions.” This solution records, analyzes, and visualizes the data of production machines. The customer’s employees can use software to simply compare this information with the key production figures in order to optimize their processes. That saves a lot of money and resources. Today co-innovation is the name of the game: creating a better solution together. Many companies are actively involved in the market for solutions related to Industry 4.0. How is Körber Digital positioned in this market? Our great advantage is our in-depth understanding of the needs of production companies — because if you don’t have a good understanding of industrial production, you can’t develop any Industry 4.0 solutions that really create value. For quite a few projects in this area, the basic idea is good — but when it comes to its concrete implementation, company owners and heads of production are often left to work things out on their own. At Körber Digital, we are very well set up with regard to implementation. Our top priority is to make sure that our applications for the Industrial Internet of Things (IIoT) fulfill the concrete demands of production processes: They have to be immediately operational, easy to integrate, useful, and economically attractive. The startup connyun in Karlsruhe was acquired by Körber in mid-2018, and in early 2019 connyun GmbH merged with Körber Digital GmbH. In your opinion, what are the biggest potential advantages of this merger? We’ve consolidated our expertise in the areas of design thinking, UX, and data analysis in Berlin and Karlsruhe so that we can create and promote digital products in their early phases — in many cases, together with our customers. At a later stage, when it’s a question of concrete product solutions, networking, big data, and cloud software, our software experts in Karlsruhe take over the work. Concentrating on new ideas: Participants of the Stage Gate event in Berlin. Lots of inspiration: At the Stage Gate event, ideas for new technologies, products, and solutions are presented in a competitive context. A radical approach: At Körber, each digital product must pass through a series of “Stage Gates” in order to reach the next stage of development. Better results, thanks to critical questioning: All of the ideas go through a multistage evaluation and selection process. Sharpening our focus on new ideas: “We believe that discussing things and struggling to find the best ideas is the salt in the soup,” says Stefano Di Santo. IIoT applications can require massive investments. Does every company have the capacity and the determination to make such investments? Of course the companies in question must fulfill the basic requirements in terms of automation technology and machine connectivity. But you’re quite right about that: For many small and midsized companies, it’s hard to finance the purchase of new systems. Instead, they tend to focus on optimally refining their existing technological systems. That’s exactly what Körber Digital is doing. Our IIoT software solutions do not interfere with the control of production systems. Instead, they build on the structure that already exists. The applications then always show the most important KPIs as well as the current status of machines or production cells, and they minimize the downtimes. Please make a forecast: What trends will be the next ones to impact the digital advancement in the field of machine and plant engineering? The sector is doing very well at the moment — but in order to ensure that this situation continues in the future, companies have to actively address the digitization process. There will have to be many more partnerships, because individual companies can no longer manage these dynamic developments alone. Software companies have been forming alliances for decades. The German mechanical engineering sector has to follow suit. Today co-innovation is the name of the game: creating a better solution together. We have a clear goal in this regard: to be our customers’ first choice for innovative, technologically leading-edge, and digital solutions. connyun: Improving efficiency with the Industrial Internet of Things.